Muzz Buzz is an Australian owned and operated drive-through coffee franchise chain, originating in Perth. The company was formed in response to growing Australian tastes for premium coffee, which was at the time, not commonly available within the Perth metropolitan area in drive- through form. Franchising of the brand commenced in 2004, with individual outlets closely resembling the original design and ethos. Executive chairman Warren Reynolds has played a major role in the coffee franchise growth phenomenon with his brand philosophy of ‘selling an experience’ being an integral part of the Muzz Buzz success. to use this as an opportunity to look for new ways to use its mascot Buzzy and further define his role within the brand. To achieve these goals, Muzz Buzz worked with design agency, 121 Creative. It was important that designer Ben Duncalf and his 121 team come up with an approach that supported both the brand philosophy of fun and ‘selling an experience’ while also delivering widespread appeal to the target market of parents with pre-schoolers through to primary school children. The brief also presented a further challenge, with franchise rights having been sold to several countries, it was important the promotional piece fit with the internationalisation of the brand. Muzz Buzz essentially required a timeless piece that would allow for rollout to the global market as and when required. A further layer of complexity lay in the fact the solution also needed to be inherently Australian. Clearly it was decided that a children’s booklet would be the most effective way to reach the target audience and support the brand values of fun and provide consistency with the Muzz Buzz approach of marketing to customers through an experience. Reynolds had a storyline in mind based on his own childhood experiences. It was important that this could be adapted to relate to children today. The most effective way to do this was to create a booklet that was both story and activity. The artwork for this promotional piece was inspired by the company’s mascot named Buzzy, reminiscent of one of the Muzz Buzz coffee cups, sporting the corporate colours of purple, white and green. It was necessary for the booklet to support the existing creative of the brand. Designers also needed to ensure that illustrations worked with the storyline copy in addition to meeting all other criteria within the brief. 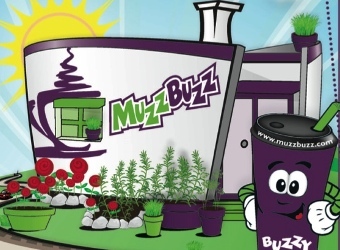 A storyline in booklet format introduced a new way for Muzz Buzz to bring their mascot to life and provide another opportunity for the company to communicate with its customers. The company wanted children to learn more about Buzzy the character and relate to his personality and experiences in the story. 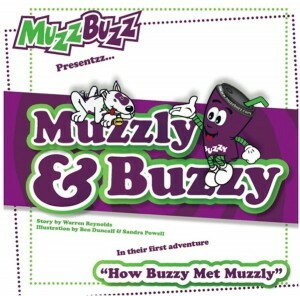 The booklet also presented an opportunity to add a new character to Muzz Buzz promotional material in the form of Buzzy’s sidekick, a dog named Muzzly. One of the considerations for the design agency was to produce visually appealing character design for Muzzly and Buzzy that children would relate to. It was also important that children could connect with each character’s personality and experiences. In order to address the requirement to retain an Australian influence, the Muzzly character is a mongrel dog that came from the shelter. This also enabled the storyline to feature the RSPCA. However, the characters and storylines still lend themselves to being adapted by each nation’s franchise chain around the globe. The 18 page, 240x240mm square booklet format was chosen to make it easy to handle. The opposite face of each page included a mirror image of an illustration to allow for colouring in. A double page spread on the last two pages lent itself to educational fun activities such as a memory game, spot the difference and a maze. The story is written in an easy style that could be suited to early readers or for adults to read aloud to children. The internationally-accepted font for children learning to read was used as the typeface for the booklet (new century schoolbook). Cleverly woven into the story are items from the Muzz Buzz menu when describing Buzzy’s favourite breakfast. Mascot Town and Wilbur Wildcat are references to the Muzz Buzz sponsorship of the Perth Wildcats with their mascot, Buzzy making regular appearances at games. But again, these are easily interchangeable with other mascots and sponsorship activity at Muzz Buzz drive- thrus around the world. Muzz Buzz printed 5000 booklets initially as a limited edition and rolled them out through company stores, local child care centres and schools as a give- away. All 5000 books were distributed, with the books serving a brand awareness exercise, especially at major events where families were present. Muzz Buzz was able to reach this new market segment of families with pre- school to primary school-age children. The client also saw a 17 percent increase in the average value of orders, as parents included something from the ‘Little Buzzers’ children’s menu. Moving forward Muzz Buzz plans to work with 121 Creative to develop the next in the series of limited edition pro- motional books following the adventures of the two characters, printed as ‘limited editions’ from the series to allow for tried and tested promotional campaigns to coincide with the release of each booklet in order to appeal to each new person falling into this target market.